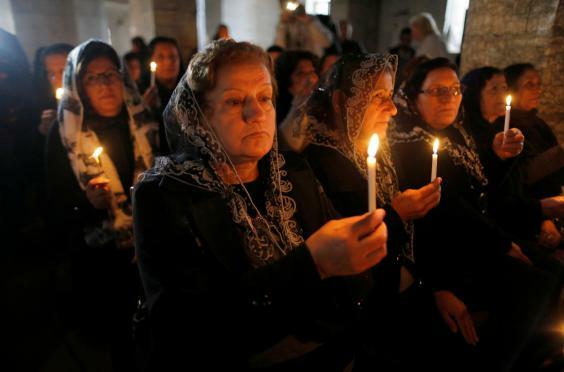 Christians in Baghdad celebrated Christmas on Sunday in a heightened state of fear after deadly attacks on Christian-owned shops that sell alcohol. Two shops next door to each other were riddled with bullet holes and spattered with blood after gunmen opened fire late on Friday in Baghdad’s Ghadeer neighbourhood. Rayan al-Kildani, commander of Babiliyon Brigades, a group of Christian volunteers formed to fight Islamic State militants, said eight Christians and one member of the Yazidi sect had been killed in the attack. “What a bloody gift they gave us for Christmas,” Joseph Warda, a Christian human rights activist, told Reuters. Maria Polos, a retired schoolteacher in the district where the attack took place, said she and other Christians were afraid to celebrate the holiday in public. This year, government forces have been pushing fighters from the militant group Islamic State out of parts of northern Iraq where it had banned the practice of any religion apart from Sunni Islam. Areas once held by the group have seen their first Christmas services since 2013, and many Christians there have sounded more hopeful than they have for years about the fate of communities that date back to biblical times. In Baghdad, the capital which is firmly controlled by the Iraqi government and security forces dominated by Iraq’s Shi’ite majority, Christians celebrate Christmas in churches decorated for the holiday. But many say they still live in fear, and do not feel the authorities protect them adequately. Although the identities of the attackers who struck the liquor store were not known, the area is predominantly Shi’ite and Shi’ite groups have firm control of security. Warda, the human rights activist, said militants from any sect that attacked civilians in the name of religion were “no better than Islamic State”. Vian Dakhil, a lawmaker from the ancient Yazidi sect, whose members were targeted in northern Iraq by Islamic State for what Western countries described as genocide, also said one Yazidi and eight Christians were killed in the Baghdad attacks. “The criminals should be brought to justice as soon as possible so that their punishment serves as an example to those who dare kill civilians in the name of religion,” Dakhil said on her Twitter page. Iraq’s Muslims celebrate Christmas in solidarity with Christians. Ammar Hussein, a member of staff at Sama Mall in Baghdad’s busy shopping district Karrada, which has a significant Christian minority, said that Muslims from many walks of life had been buying Christmas trees and other seasonal products. “Muslims love to share this holiday season with their compatriots,” he said, adding that injustices towards the country’s Christians “are not caused by Muslims but by those who hate Iraq”. A married Muslim couple said they were buying a small Christmas tree and some gifts because they chose to celebrate Christmas “like the rest of the Islamic holidays”. Christians are not the only religious group to be persecuted by Isis. In August 2014, extremist fighters attacked the town of Sinjar in northern Iraq as part of their campaign to eradicate the Yazidi people and “purify” the region of non-Islamic influences.